Winter is coming whether we like it or not!! It got pretty cold last week & this weekend so it was time to start adding some of my heavier coats into rotation. I got this parka for my birthday in July during the Nordstrom Anniversary sale & have been waiting for the days when it was finally time to wear it! I love the big fur hood on this coat & the fact that even though it's warm, it's not overly bulky! There are 3 types of heavy coats that I usually stick with during the winter & I highly recommend having all 3 in your closet, especially if you live in an area like NY where the weather is so cold for so many months out of the year. 1. PUFFER COAT. The warmest of all winter coats is a puffer coat. I love this style for snow days because of it's sporty tendency. Try one in a bright color to make a statement. See how I styled a puffer coat here & shop my puffer coat here. 2. WOOL COAT. Love a warm wool coat when I need to dress up during the winter. These coats are sleek with clean lines, often making them expensive looking even if you don't spend a ton. See how I styled a wool coat here & shop my wool coat here. 3. PARKA. Similar to the one I'm wearing today, I love a parka worn with more casual looks. In a military green or navy color, this coat style looks cool with just about every outfit your pair it with. Shop my parka here. Don't forget to enter the giveaway & join the link up below!! DON'T FORGET: 'Tis the season to give back! 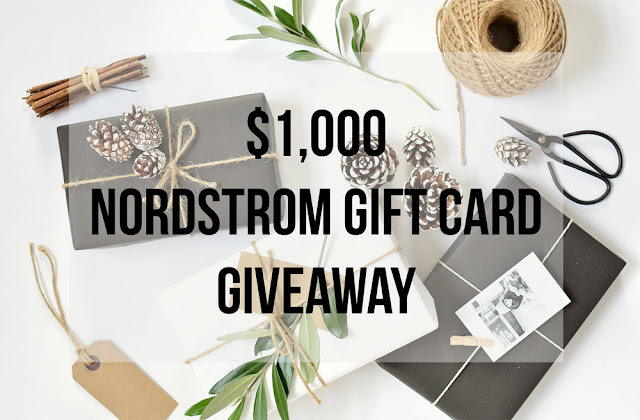 I’ve teamed up with an amazing group of bloggers to give one of YOU a chance to win: a $1,000 Nordstrom Gift Card, to make your holidays just a little bit sweeter! Enter below by completing the Rafflecopter. This giveaway is open internationally for one more week! Good Luck! I love this jacket Michelle!! It is so important to keep warm now that it's getting colder, but it doesn't mean we can't look good too! Definitely! I look chic, cozy outerwear! I love a good parka! Sounds like a great giveaway! Gott love this season for all the cozy jackets! That coat is so cute! I love the fuzz on the hood of it. Oh my gosh, those boots are so cool! I love the pearl heel. I got a parka similar to this last year and wear it so much. They are so comfy too! Highly recommend them! I love the fur trim on that cargo coat! The color is perfect and it just looks so cozy! I am looking for a cute puffer coat! I would recommend North Face! They have a huge selection of styles & the coats last forever! I love your parka, and those booties are so dreamy!! I love this coat! It look so warm, and it's a great color. I need to get a new parka this year! This one is awesome. I love the large hood! This parka looks perfect for winter - and so stylish on you! cutest coat ever! great look! Love how you styled this look!! Adore your fur jacket!!! I absolutely adore this winter coat! The fur trim and olive color are so chic. Thanks for the link up! I'm allll about stocking up on new outerwear pieces come fall- love this parka, babe! Oh I love this!! I love this coat so much and it looks soo warm!! You are looking so cute! Great suggestions! Love the casual look you've styled here with the parka, such a perfect fall and winter piece! Amazing post, dear!!!! A big hello from India!!!!! Love that coat! Looks great! You look so pretty! Love your jacket! SO CUTE! That is a gorgeous parka and I love your embellished boots! Your over-sized jacket is really cute dear! I need that for winter too!